Incumbent Massachusetts Gov. 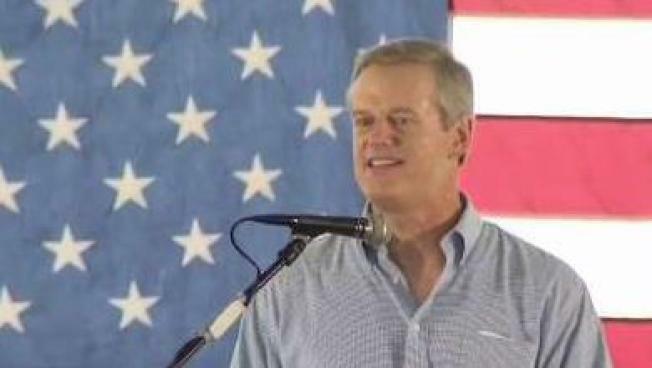 Charlie Baker formally announced his bid for re-election on Saturday. Baker and Polito made their formal announcement at an event in Shrewsbury on Saturday afternoon. Baker has been governor since 2015. Baker and Polito have a formidable campaign war chest. Baker faces one Republican primary challenger in September. Massachusetts Gov. Charlie Baker formally launched his re-election campaign today. The Republican governor and Lt. Gov. Karyn Polito made the announcement on their re-election bid this afternoon at their annual summer picnic in Shrewsbury. Baker has been governor since 2015. Baker announced in November 2017 that he would seek another term. He previously said he wanted to wait until the legislative session was over before turning to campaigning. Baker enjoys high popularity ratings in the state, but he won't go unchallenged. Two Democratic candidates, Jay Gonzalez and Bob Massie, are fighting to face Baker in the general election. They face a signficant challenge due to Baker's large campaign war chest of $8.4 million as of Aug. 1, according to the Boston Herald. Polito's war chest has nearly $4 million more. Both Democrats have less than $500,000, the Herald adds. The governor is expected to lay out his case for a second term during the announcement at the Scandinavian Athletic Club Park. The Republican from Swampscott will reportedly emphasize his working relationship with the Democratically-led Legislature, cite the state's booming economy and low unemployment, and discuss his work to combat the state's opioid epidemic, according to The Boston Globe. Baker resides in Swampscott. He also faces a primary challenge from Scott Lively, a conservative and Springfield pastor, during the primary on Sept. 4. "He's done more for the left in gun confiscation than the democrats have done anywhere in America," Lively said. Lively called Baker a "phony conservative," as well as a "Democrat in Republican clothing." "I will implement the full Trump agenda here in Massachusetts," Lively said. "Many of his views, especially with respect to the gay community, are appaling," Baker said. Lively's campaign has raised just under $13,000 thus far.